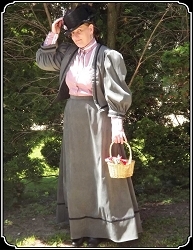 Here are just a few examples of our Victorian period clothing put together to create unique outfits. 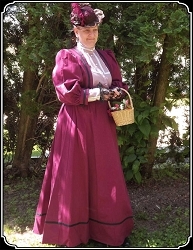 They illustrate some of the ways you may combine our Victorian dresses and other old fashion clothing and accessories to really showcase your character and personality. 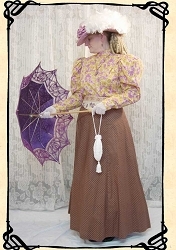 You will conjure visions of the Late 1890s into the Turn of the Centry with this Jacket and Skirt outfit. 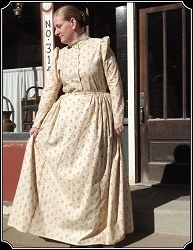 Epitomizes the true Old West pioneer woman spirit from days gone by. Even the more-reserved school teacher saved her pennies to look pretty and professional in her trade. Stroll down the boulevard in this most-appealing outfit and catch the attention of all who turn your way. Stand tall watching your herd in this outfit fit for a cattle baroness. Attract the attention of all the cowboys in town in this flirty Saloon Gal outfit. A stunning outfit perfect for that afternoon tea party with friends or a special suitor. 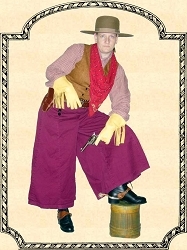 Tickle 'yer cowboy's fancy wearing this sophisticated yet racy dance hall outfit. Paris' Moulin Rouge offers noth'un better or classier than our own spirited Can-Can Beauty.